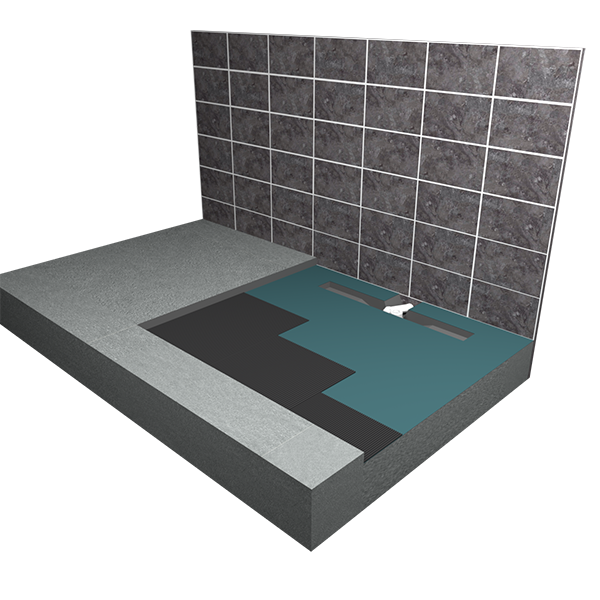 This installation guide shows steps how to install wet room kit shower tray Showerlay Wiper into a concrete floor how to tile it over. After placing an order for one of shower trays for wet room in our offer you will receive foam based XPS with 2% fall prepared during manufacturing process from every corner of the tray to every corner of the drain, with integrated waterproof stainless steel channel. Shower tray is reinforced with fibre glass mesh and cemental glue layer. Drain is built in during production process, wateproofed, suitable grate and McAlpine siphon trap included. Showerlay former board can be 20, 30 or 40 mm thick. Drain goes 15 mm above the shower tray and approximately 50 mm below the bottom surface. Upper surface is slope while bottom is even. The thicker shower tray, the more noticeable fall is. 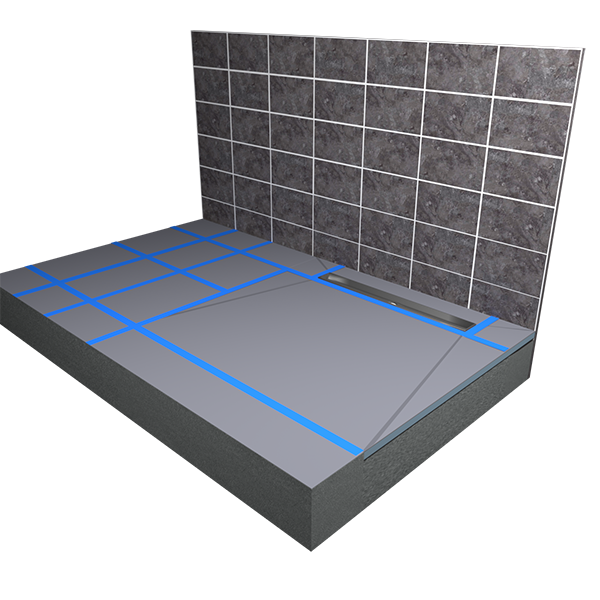 Depending on your existing floor board thickness (usually 20 mm) and future wet room layout you need to decide which thickness is right for you. It doesn't require any underboarding but screed should be even, clean and solid. Tanking kit can be included to your wet room kit to receive additional package with insulation materials. Each tanking kit covers 3.2 square metres and contains useful materials to make your shower and splash area wateproof, which is highly recommended. Additional sealing materials can be bought from our Construction chemicals category. In depth guide is available on DIY insulation guide page. Showerlay drain itself is wateproof but the, connections between floor board and shower tray and rest of the room require tanking. 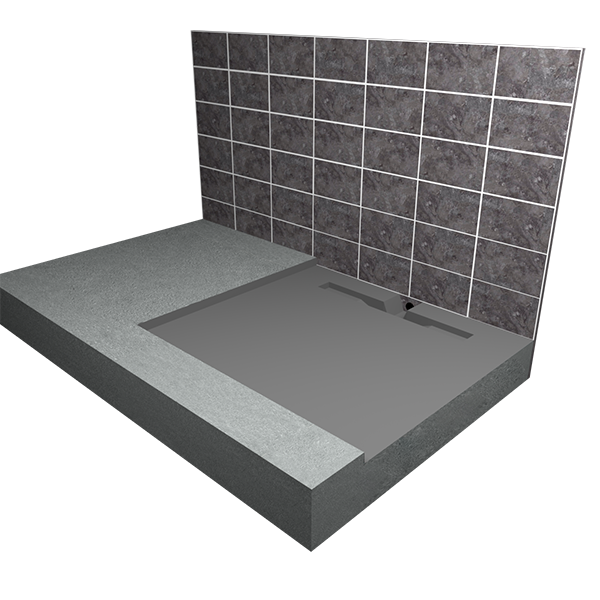 Wateproofing entire shower room is optional, however tanking shower area and splash area is mandaty and should be always undertaken prior to installation. 1. Preparation of floor and walls. Gather required materials and tools. 2. Establish shower area by lying the shower tray in desired future shower position. 3. Grind the concrete to prepare a slot for shower tray. 4. Cut a hole for siphon trap and pipework. 5. Connect the siphon trap pipe to your waste system. 6. Prepare even surface by cleaning and bedding the concrete. 7. Fit the wet room kit using fixing adhesive. 8. Assembly the drain with siphon trap. 9. Fill remaining shower area with tile backer boards. 1. Prepare floor and walls and clean it from dust, debris. Remove garbage and make sure you have sufficient space for comfortable work. Prepare materials and tools necessary to complete the installation, you will probably need a level, chisel & hammer or jackhammer, pencil, measuring tape, brush, notched trowel, tile adhesive. Handsaw can be used to trim the shower tray to trim to size, but equal distances from both sides should be cut to preserve proper fall towards the drain. 2. 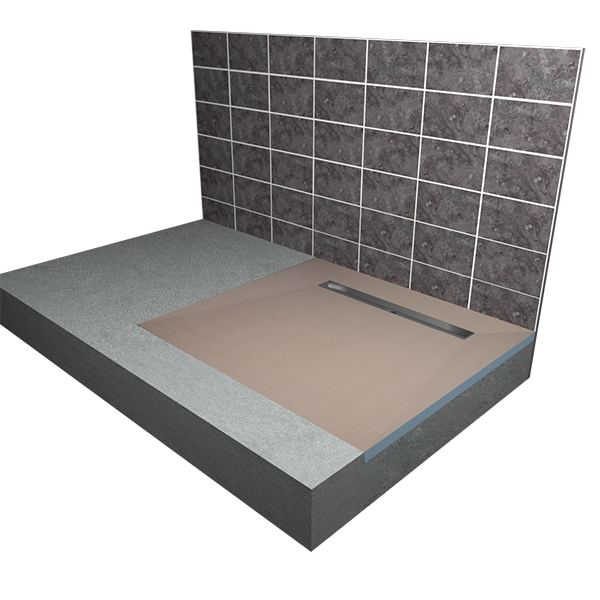 Establish future shower area by placing the shower tray on top of existing screeded floor. Make sure shower tray is sits tightly in the corner. Use pencil to draw perimeter around board and inside to drain outlet to mark the position of the tray and waste. In case of upcoming screed, shutter off the future shower tray position and leave sufficent space to make it flush with rest of the floor. 3. 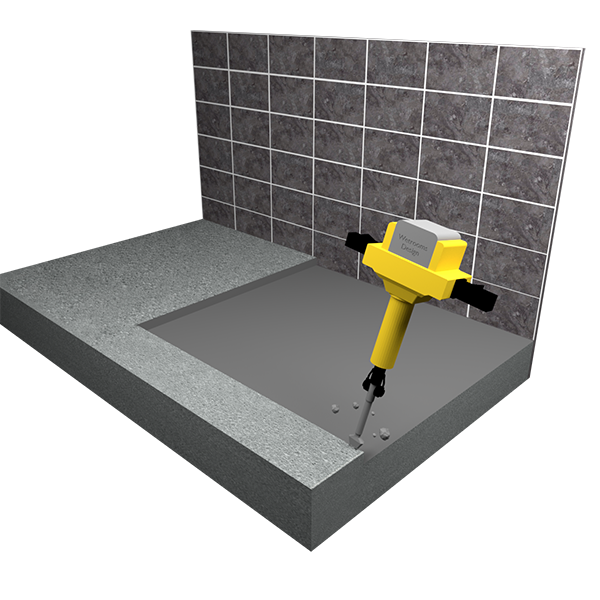 Remove existing concrete layer as thick as Showerlay using a chisel and hammer or jackhammer. Grind a square or rectangle matching previously drawed Showerlay shape. Identify future position of waste approximately 65 mm below the concrete surface and pipework. 4. Find the best possible drain position and angle to connect it to your pipe work. Siphon trap can be rotated in 360° and waste pipe's height can be adjusted, giving much flexibility for proper positioning. Ensure the siphon trap is supported below with concrete. If created hole is too deep build up support with cement. 5. Connect a standard 50 mm compression pipe into the end of the siphon trap. Ensure you will be able to assemle the siphon trap with upper fixing part from above of the steel drain channel and black rubber seal below. If you are sure that the siphon trap is well supported in correct place use silicone sealing adhesive to fix the siphon trap's pipe to your waste system. Now perform a simple test if water flows correctly by pouring water into the siphon. 6. Clear prepared slot in concrete from dust and debris to allow fixing adhesive work below entire tray surface. It requires solid and even support, so if your concrete has a lot of holes and is uneven, use the floor leveler compound for concrete to lay a thin fixing surface, it also gives floor flexibility to move without micro cracks in screed. Use a bubble level to verify prepared support. 7. Put the Showerlay down to check if it sits in correct position and if it's flushed with rest of the floor. Check if you are able to connect the siphon upper part with waste trap underneath the shower tray and if it sits on previously prepared support. Use the level to check if the tray is even and if the drain channel is the lowest place in the shower area. Test if the linear drain channel matches the hole in ply support. 8. 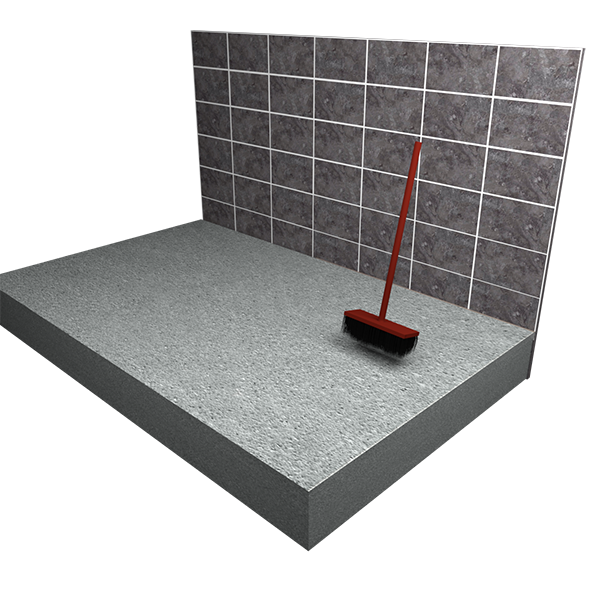 Apply 0.5 - 1 mm standard tile fixing adhesive over the created support using nothed trowel. Ensure the adhesive layer is even over the entire area. Stick the wet room kit to the concrete slot and assemble the channel drain with the siphon trap below. Use silicone to seal the white part of siphon which is used to be screwed down the trap from above and fix to the channel. Make sure everything is well supported and sits in correct position. Wet room should now be flushed with remaining area of the room. 9. Distance from the shower tray surface to the top edge of vertical drain frame is 15 mm, so if you need to build up that space, use tile backer boards. They are perfect material to tile over and should be used as well over the rest of the floor. Wateproof the connections between boards and also floor/wall connections using tanking liquid and waterproof tape contained in waterproofing kit. Apply sealing corners and pipe collars where necessary. Liquid foil can be used as adhesive to stick these. Chat started. Session ID: 1556253646. You are now connected to: David M.